Darius just doesn't fit. He's half Persian, but knows more Klingon than Farsi and is more comfortable with Hobbit social cues than Persian. So, Darius fears the worst when his parents announce a trip to Iran to visit his mother's family for the first time. Struggling with depression, a difficult relationship with his father, and a little sister who is everything he isn't, Darius feels way out of place. That starts to change when he meets Sohrab and an entirely new world is opened up. Sohrab is a lifeline, helping Darius discover himself and his place within this new sprawling Persian family. This book is so charming! I completely fell for Darius, and his entire family and would live between the pages of this book forever if I could. Make sure to read this with a cup of tea! Darius doesn't think he'll ever be enough, in America or in Iran. Hilarious and heartbreaking, this unforgettable debut introduces a brilliant new voice in contemporary YA. Darius has never really fit in at home, and he’s sure things are going to be the same in Iran. His clinical depression doesn’t exactly help matters, and trying to explain his medication to his grandparents only makes things harder. Then Darius meets Sohrab, the boy next door, and everything changes. Soon, they’re spending their days together, playing soccer, eating faludeh, and talking for hours on a secret rooftop overlooking the city’s skyline. Sohrab calls him Darioush—the original Persian version of his name—and Darius has never felt more like himself than he does now that he’s Darioush to Sohrab. Adib Khorram’s brilliant debut is for anyone who’s ever felt not good enough—then met a friend who makes them feel so much better than okay. Adib Khorram is an author, a graphic designer, and a tea enthusiast. If he's not writing (or at his day job), you can probably find him trying to get his 100 yard Freestyle (SCY) under a minute, or learning to do a Lutz Jump. He lives in Kansas City, Missouri. "Heartfelt, tender, and so utterly real. I'd live in this book forever if I could." "I've never read a book that so powerfully demonstrates how connecting with where you come from can illuminate who you are and help you figure out where you're going. 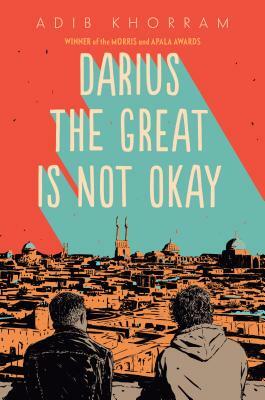 From its deadpan Star Trek humor to its brilliant examination of mental health, Darius the Great is Not Okay is a supernova of heart and hope that's sure to become a classic." "A love letter to anyone who has felt uncomfortable in their own skin and wondered where exactly they belonged. A big-hearted and marvelous debut." "Prepare to fall hard for Darius. His voice will grab you instantly, with sharp humor and tender growing up moments, and won't let go until the very last page. This is openhearted storytelling at its best."